Mike's News carried on business as an Edmonton institution from 1912 until 1986. Its distinctive sign, with the engrossed reader, his hat showing above his copy of the Toronto Star Weekly, and one crossed foot wagging away, was a landmark on Jasper Avenue from 1934 until it was removed in 1979. The "newsstand" remained at 10062 Jasper Avenue for most of its life, until it was moved to 10119 101 Street in 1979, at which time the sign was donated to Fort Edmonton Park. 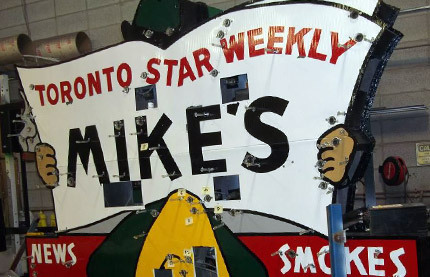 John "Mike" Michaels was also something of an Edmonton institution. He arrived in Edmonton from New York City in 1912, and began selling newspapers using a horse as transportation, and later a four-wheeled vehicle powered by a motorcycle engine. Michaels began by selling newspapers on the corner of First Street and Jasper Avenue after buying out Mickey Ryan and Walter Wolk, obtaining their busy spot to conduct his downtown newspaper vending business. His other claim to fame was the work he did with the Newsboys (usually underemployed adult males of various ages) who delivered the papers. Mike assisted them with education, career advancement and social betterment through opportunities like the well-known Edmonton Newsboys Band, which played at many civic functions and even toured around Canada and Europe. One of the few places where special orders could be requested from publishers around the globe, Mike's News was a popular community meeting place, more than simply a retail space.